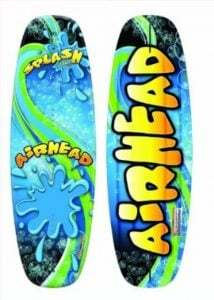 Airhead is one of the most popular names in water sports, and over the years wakeboarding has become one of the most popular around the world. The exhilarating fun that riders have when wakeboarding mixes the best of all worlds including water and extreme sports. Riders of all different styles and skill levels have become very familiar with Airhead wakeboards as they have easily become one of the biggest names on the water. 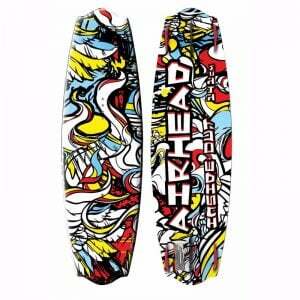 When looking at the different types of Airhead wakeboards there are many things to consider before making your next purchase. To make it easier, we have broken each board down giving you the best of the best while also shedding light on what could be improved upon. Whether you’re a beginner rider looking to get on the wake for the first time or an experienced rider looking to upgrade your board, we have considered all you need to know. The following review looks at the good, bad and the ugly in the following Top 10 Airhead Wakeboards of 2017. Rip Slash scores an amazing 9.7 out of 10 and is the top-rated Airhead wakeboard of 2017. This high-performance board is recommended for intermediate and expert riders who weigh less than 150 pounds and is cheaper than most boards in its class. Slash is a highly durable board that is suitable for the most aggressive riders, but performs with a great deal of precision for even the most graceful of riders. The aggressive and color scheme of Rip Slash is truly amazing which weighs just under 10 pounds and is 141cm in length. Complete with removable center fins, curved side fins, and a continuous rocker, performance is not an issue. Before and after the wake, you’ll get great pop, speed, and soft landings every time. The Radical Wakeboard is just that, it RAD. This board scores a 9.6 out of 10 and for a very good, and numerous amount of reasons. With superior performance which includes amazing pop coming off the wake, great speed, and natural turning and cutting makes this a must have for riders with all different riding styles. Whether you are beginner or experienced wakeboarder, Radical will help you transition from one skill level to another. There’s no reason to buy a board that you will outgrow in a matter of months as this board was meant for the same rider to transition from one skill set to another. Great durability is taken to the next level with its fiberglass rods and RIM-molded PU-core construction will keep you on the wake for many years to come. 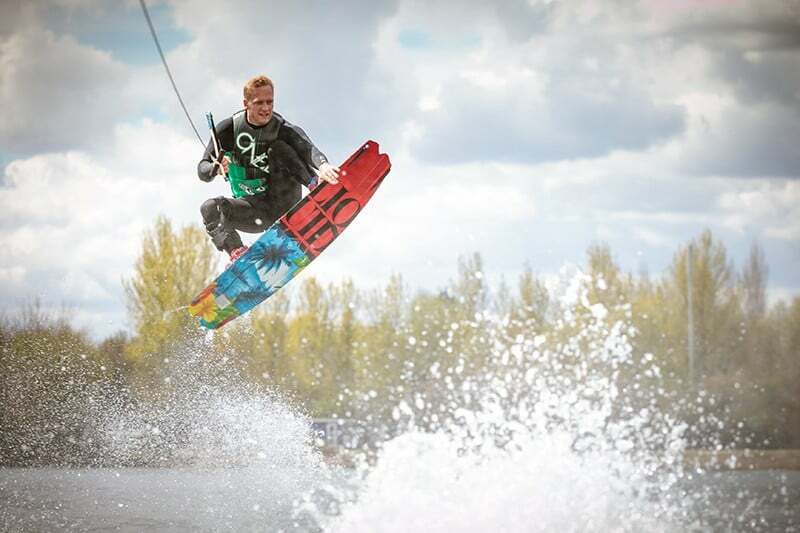 Booyah comes in as one of the best Airhead wakeboards of the year, and there are numerous reasons why. 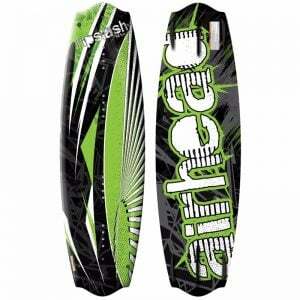 This high-performance wakeboard is a must have for enthusiasts and those looking for a very visually appealing ride. This board is one of the best sellers on Amazon and comes in as a budget friendly option which is under $130. Booyah is a freeride wakeboard that offers a unique floaty feel. Those looking to take advantage and own the wake can do so with this board which is suitable for riders under 170 pounds. The graphics are more appealing to youth riders than adults, but Booyah accommodates riders of all ages. Complete with a beveled perimeter and rounded edge profile along with two fiberglass reinforced nylon fins for superior performance. The Graffiti City Wakeboard was created with transitional riders in mind, and if you’re a beginner looking to get into wakeboarding for the long-term then this is a great choice for you. The customization options make this board very appealing to all riders while beginners will feel the ease of use while intermediates and more experienced riders and make simple adjustments tailoring the board to more of an aggressive use. This board is amazingly priced which comes in around $130 which is more of a bargain, especially considering what you get. Featuring rounded end profile, beveled perimeter, and two removable fins will turn beginners into confident riders in no time at all. 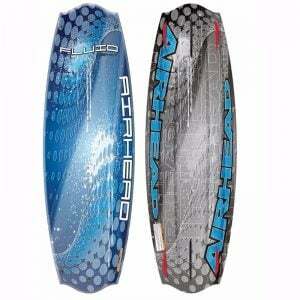 The Airhead Fluid Wakeboard scores a 9.3 out of 10 and comes in at #5 of our list of top 10. The aggressive look of this board goes far beyond the amazing, but subtle appearance as it offers many customization options that are lacking in other performance wakeboards. Fluid offers a way for riders to tailor their ride to their own liking with removable fins which makes it highly recommended for all riders of all skill levels. The performance of Fluid has helped make it a top seller on Amazon and a highly recognizable board with water sport enthusiasts. Boasting durability, speed, precision, and customization, along with a continuous rocker, 6 fin thruster system, and curved and angled side fins, this is easily one of Airhead’s best wakeboards of the year. There are some boards out there that just make you a better ride as soon as you get on, and Airhead’s Spike wakeboard is one of the few. This wakeboard has a minimalistic approach, but once on top it’s everything but simple. Combining the best in water sport technology, Spike was created for with the needs of all riders in mind as beginners love its ease of use and intermediates love the ability to learn more tricks, much easier. The learning curve of Spike makes it a top choice, and when factoring in the budget friendly price which comes in just over $160 which is a great deal for the money. With excellent pop off the wake and amazing tracking with turns and finishing tricks makes this a great board for water sport enthusiasts. 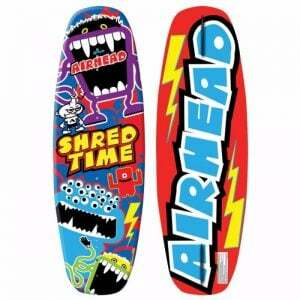 Shred Time is Airhead’s best youth wakeboards out there, and one of the best on the international market. The graphics and color pattern gives it a great deal of visual appeal to younger riders and the ease of use makes it very good for beginners. Giving riders a competitive edge with a minimal learning curve which will have you enjoying your time on the wake in no time at all. Some of the best features of the Airhead Shred Time Wakeboard include a continuous rocker, removable nylon fins, and a twin tip free riding wake experience. It weighs only 6.8 pounds and its lightweight design will have you feel like you’re floating on the wake instead of cutting through it. Inside Out is a true bargain which helped it score an 8.9 out of 10. This wakeboard is best suited for intermediate and experienced riders and not a welcomed addition for beginners. The learning curve is slightly more than most, but the performance is much better. Some of the most notable pros of the Airhead Inside Out is great tracking, hold, speed, and of course, the price. Priced to sell which comes in just over $150, Airhead proves once again that high performance boards don’t have to cost a fortune. Coming in at around 9 pounds, 141cm in length, along with center fins and a 6-fin cluster, you’re getting a whole lot of board, for not very much. You’ll never see a better price than this for a performance minded wakeboard as the Airhead Apocalypse comes in at just over $40. Yes, that’s right, and what you get for a few more than a few bucks are amazing which include a uniquely styled board, lightweight board, along with curved and angled fins makes this a steal at this price. Apocalypse won’t appeal to everyone as the visuals is more of an acquired taste. Riders have either reported as loving it or hating as there is no middle ground when it comes to appearance. Recommended for more experienced riders and not for beginners which offers great tracking and speed. 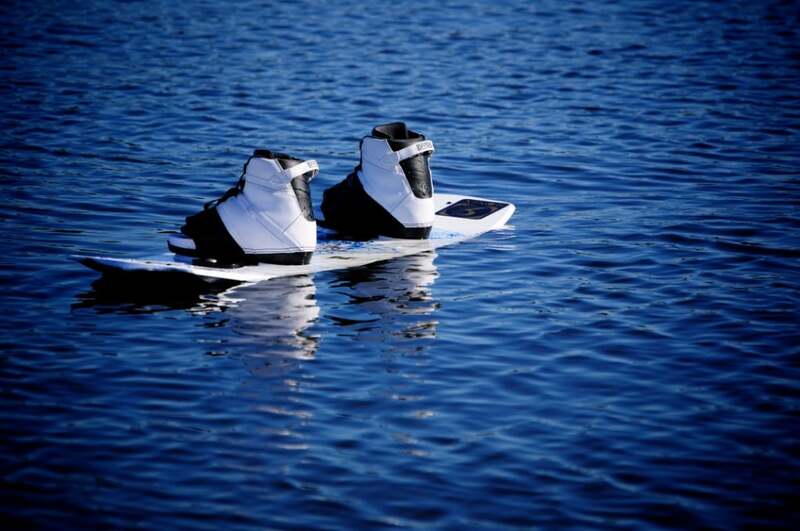 The Airhead Splash Wakeboard makes our list of top 10 of the year with a great deal of balance. This board is not perfect in any one rating category, but offering riders the ability to accommodate all needs and desires makes this a very safe purchase. Coming in with a very respectable price, you can get on the water for less than $170 which is pretty good considering the performance that Splash give you. This board is recommended for beginners and offers a great learning board for tricks, jumps and other stunts. This youth board accommodates riders up to 130 pounds and features a strong and durable construction, removable fins, and a smooth ride. Great price and good performance for beginners makes this a good choice for those not looking to spend a fortune.